Whispering Pines Bible Camp is excited and blessed to be able to offer a spot to a lucky camper who might not otherwise have the chance to get to camp. April 22-28 WPBC will be profiled on Calgary's own Shine FM "Send Your Kid to Camp". 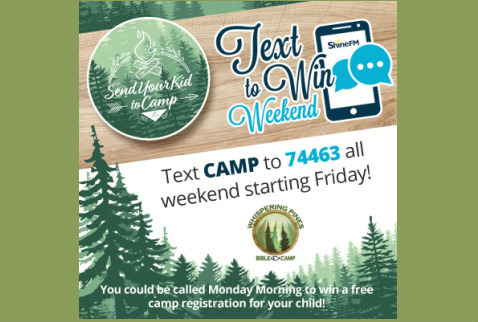 Please listen to Shine FM for contest details and to have your chance to win a week at our precious little camp. Contest open April 26-28 and the draw will take place on April 29. We hope the exposure on Shine FM will let people know their kids are welcome to become a part of the growing Whispering Pines Bible Camp.